A funny thing happened along the way to testing a carbon nanostructure for toxicity. The lab rats who got the toxin lived twice as long. Is there a possibility here for human health? When I went to school, they taught us that carbon was found in nature in two elemental forms (or allotropes). Graphite consists of 2D sheets of carbon atoms that slide over one another so smoothly that graphite is slippery enough to be used as a dry lubricant. Diamond consists of carbon atoms in a 3D tetrahedral network, so rigid that diamond is the hardest material known to man. It was in 1985 that a third form was discovered: 60 carbon atoms arranged in a pattern of alternating hexagons and pentagons, exactly as on a soccer ball. The substance was named “Buckminster Fullerene” after the inventor of the geodesic dome, and the molecules are nicknamed “buckyballs”. At first, the chemical synthesis of C60 was performed via an intricate and complex recipe. 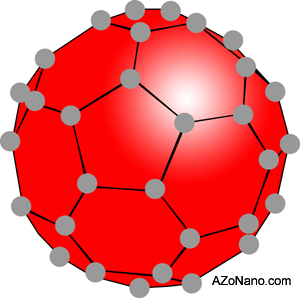 But then it was discovered that fullerene is all around us, and has been all along, unrecognized. C60 can be found and refined in the soot from a candle flame! Buckyballs are hollow, and clever chemists can manufacture them with an atom or small molecule locked inside. The chemistry of buckyballs is both unusual and diverse, with applications ranging from lubricants to superconductors. Last year, a team of French biologists reported that in testing fullerene dissolved in olive oil for toxicity, they were surprised to discover that the rats lived nearly twice as long as controls. The result was the more remarkable because the rats were middle-aged by the time the study began. There were only 6 rats in each of 3 groups. But none of the C60 rats contracted cancer, and they all lived >50 months, which is long compared not only to normal rats, but compared to other longevity studies, including caloric restriction. So the size of the effect has raised eyebrows, and suspicion that the result must be an error. Another surprise is that C60 is not even a biomolecule. So much of metabolic chemistry depends on signal molecules that act like switches that can change gene expression and initiate a cascade of other hormones. But C60 so simple and symmetric that it cannot be acting in this way. Its effect is likely to be much more direct. The olive oil is crucial. C60 molecules clump together, and it took weeks of stirring to get them dissolved in the oil. The more usual clumpy form of pure C60 clogs cell metabolism and is likely toxic. The treatment with C60 was intensive for a week, then spread out over 7 months. After that, the rats were “coasting” the last 3 years of their lives on whatever benefit they gained in their 2nd year. But these effects are broad and varied, not highly specific like a biomolecule. This is why C60 was thought far more likely to be toxic than beneficial. Echoes of my report last week on SkQ: Like SkQ, C60 also concentrates itself spontaneously in the mitochondria, and like SkQ, C60 is a powerful free radical scavenger, which means it efficiently de-toxifies the reactive oxygen bi-products from the cell’s energy production. Some people have started taking C60 in olive oil, though it is not yet approved in the US for human consumption. It can be purchased for (nominally) laboratory tests. I consider myself an early adopter, and have experimented on myself with several substances that are not yet fully validated as life extension agents. In particular, I take Product B for telomerase activation and have taken TA-65 in the past. I have also tried Skulachev’s eye drops, described last week. But 6 rats do not provide nearly the confidence I would need to ingest C60 myself. Experience reminds us that contradictions and inconsistencies abound in animal studies. Many results don’t hold up over time, and even the most robust results from animals are found at times to be inapplicable to humans. The French research team, headed by Fathi Moussa, has begun efforts to replicate the result with more animals. This is the right next step. I strongly suspect that a deeper biological mechanism is involved in the health and longevity-producing effects of C60 despite the prevailing wisdom. As I see it the candidates for these deeper effects of C60 are (1) effects exercised on DNA including impacts on structural configuration, epigenetic gene activation effects, histones and nuclear envelope shape, (2) effects exercised on microtubule structures in cells, (3) effects on mitochondria, and (4) epigenetic impacts such as on histones and DNA methylation. He goes on to detail his support for all four hypotheses. If you’re interested in this topic, I suggest reading the full text as a next step. Personally, I take Product B, which is available from Amazon and elsewhere at about $100/mo. Would not epithalon peptide be more effective at lower dose and cost? 2) See comment by “niner” at the bottom of the same blog page, claiming that there are now thousands of people taking C60 in olive oil, and that their anecdotal experiences have been very positive. Are you sure that the French team headed by Moussa are in the process of trying to replicate their results with more animals? This is the first I’ve heard of that. Many of us who take C60oo have been waiting for scientists to attempt to replicate or expand on the results supposedly achieved in 2012. I haven’t read anything about C60 since I wrote this more than a year ago. I’m sure there are lots of people like you with experiences that by now should tell us whether there are benefits for humans. What is your experience? Is there a web site where people are sharing their stories about C60? I’ve been taking C60 in extra virgin olive oil (EVOO) daily for almost a year now. I’ve been very diligent about not missing a day and given that I plan to use C60 for the foreseeable future, I count myself in the vanguard of people sufficiently impressed with the research so far to actually use it on myself (FDA be damned). I figured that given my family history, genetics and lifestyle, I’d probably reach my mid 80’s (barring some freak accident) before kicking the bucket. So I will consider this experiment an unqualified success if I live 20% longer (live to 100) and a miracle if I hit 120. I don’t take any other longevity medications. I have moved to a 80% vegetarian diet, exercise moderately, don’t smoke, rarely drink alcohol and intermittently fast (16 hours of very low calorie intake per day). Given that I am 58 now, I realize that 4 to 6 decades is a long time to wait to find out whether my self experimentation with C60 dissolved in EVOO worked. However, I’m already feeling positive results – could be psychosomatic but I don’t think so. On most days, after I’ve had my usual dose, I experience a slight buzz followed by a feeling of well-being and alertness. Perhaps it’s just a side effect that has no impact on longevity, but it is definitely a positive feeling. That’s good because it makes me look forward to my daily dose and frankly is the reason I’ve been so diligent in taking my C60. I’ll post any observations here over time as they occur. If anyone else is like me, shoot me an email as I’d be interested in your experience. Thank you, John! And thanks for the link to http://c60research.com . great report – I would like to try C60 also. – what exact brand of “C60 in extra virgin olive oil (EVOO)” you take? – what daily dose you take? – what lont term experiences you have noticed on yourself improving? IF you want to know more about C60oo, its effects, dosage, costs, sources and how to prepare your own, google “longecity c60” and follow the links. The site is a treasure trove of information and discussion on C60 and aging in general (although most members agree with Aubrey). Personally I have been using C60oo for about 3 years now with only positive results. If you buy a commercial preparation the cost is quite high but you can make your own for a fraction of the retail price, its not hard. If you’ve written your experience up somewhere, perhaps you can include a link. I have written on the LongeCity forum, I have tried to look up my posts but unfortunately only the last 12 months are searchable. My relevant posts are now all more than 12 months old. That said I can tell you that all my experiences with C60 Olive oil (c60oo) have been good, as have those of my immediate family and friends. Immune response is elevated or at least viruses are suppressed, as I have only had 2 colds and no flue since starting C60oo. Hair loss from my scalp has slowed or stopped, but I have not experienced the regrowth that other forum members have described. Physical endurance is increased substantially, this has been widely documented on the forum. Muscles don’t tire as quickly, they don’t hurt, but as my son and others have found, you can easily cause tendon damage which can take a long time to heal, because you can now push yourself far harder than ever before. The amount of sun exposer you can tolerate without burning is dramatically increased. I work outdoors for upto 12 hours a day and find I now tan without burning. But for me the most noticeable effect was the effect C60oo ingestion was on my left knee which had recieved a stem cell injection 3 months before. Briefly I had broken the Tibial Plateau in a fall 20 years ago, it was repaired and I had developed arthritis; the orthopaedic surgeon wanted to do a total knee replacement, a stem cell trial was to be conducted in Sydney, I enrolled was accepted and recieved the stem cells in the knee. Three months later the trial was completed, my MRI’s had shown regeneration in my knee, but I still had some residual pain and not quite full range of movement in the knee. From my perspective the trial was a complete success and I was very happy. LongeCity had just discovered the Baati C60 trial, there was much discussion in the forum and some had started to try it. I was keen to try it, so purchased some and gave it a go. To be honest I didn’t know what to expect, but certainly didn’t expect it to effect my knee. In the course of 2 weeks all residual pain and swelling had completely gone and I now had full range of movement in the knee. The original stem cell injection seemed to be active for about a month, with no noticeable change in tha last 2 to 3 months before the C60oo, so I really think the C60oo had a major impact. I originally purchased the preperation from CarbonC60.com but later decided to make my own. I buy the C60 and a local extra virgin olive oil, add .65 mg of C60 to 1 litre of olive oil and mix it with a magnetic stirrer for about 10 days then store it in the kitchen cupboard. My dosage is about 15 ml once a week. If you don’t want to wade through all the C60 posts at LongeCity I suggest you become a registered user ( costs nothing ) then you can use the search facility. Look up Turnbuckle’s personal profile. There you will find a very detailed summary of C60oo and its effects. You can also lookup an attempt to replicate the Baati study with 3 old mice conducted by Agevivo, it had some problems but was still quite interesting. Since C60 is only available for research, I have been feeding my 75 kilogram research rat one eyedropper full each day for the last year. There are no negative side effects. It is safe and non toxic. I am 73 years old. I had open-heart surgery 2 years ago. The result I have to report is an increase in muscular strength. I can now put a 100 pound barbell over my head in a military press. I don’t know if this is from C60 or just from weight lifting exercise, maybe both. I have had no colds or flu for a year since taking C60. Sore joints have healed up, and arthritis disappeared. I am still partially bald with graying hair; so no real improvement there as yet. I get my C60 from Vaught at C60antiaging.com for a reasonable $20 per month. It is shipped from Europe; and takes about a month to deliver in the US. Some eyedroppers don’t fill all the way to the top of the glass; so I sometimes have to fill the dropper twice. Some Dark Force (FDA?) has been scrubbing comments like mine off of the Internet; so it is hard to find positive comments from users; although scientific comments do not get scrubbed. Apparently there are a lot of others raising pet rats; because c60antiaging.com reports 15,000 American customers buying C60 from them on a monthly basis. The only complains so far is slow delivery, caused by US Customs screwups, especially the first 2 months this year. It is nontoxic, so all you can loose is $20 per month. Otherwise, you will die of old age before C60 ever gets tested and approved by the FDA, if that is what you are waiting for. Are there any other rat lovers out there? Join the Party! Have been taking C60 for approximately 5 months (Vaughter Wellness, 1/2 tsp/day) but inflammation has increased (however, this time of year is usually bad anyway). With C60 I was hoping to reverse the damaging effects of Accutane (orally ingested when I was 27, now 58). Within the last month I have noted an alarming decline in cognitive function; I am forgetting simple words. So I am discontinuing C60 as it’s the only ‘new’ introduction to my normal routine. Hopefully my normal regimen of Acetyl-L-Carnitine, ALA and Omega-3 can reverse any damage C60 might have done. I will however step up use of Olive Oil (I generally use Flax Oil) because of its obvious benefits. I just had a real bad response to C60, within an hour or so after taking it. After just 1 dose I notice brain fog and dissociation. This made me realize what I am doing: experimenting with some weird, scary drug of which the effects and side effects on humans are still completely unknown and which is supposed to have extremely longterm effects on the human body. Creepy. I have read somewhere else that someone had an extremely bad response within hours that lasted already for half a year. Not something to experiment with to my idea, despite positive reports. Never again for me, hope the brain fog disappears. Thanks for the warning, Marian. I agree completely. I would never take a drug that has been tested only on 6 rats, no matter how good the results, and I would not recommend it to friends or readers. But I must admit there’s a part of me that is glad there are people who are trying it and making their experiences part of a public record. Hi All, it is time to become proactive and do our own research with C60 at our own home. This time we should use rats for such research, buying cages and rats and placing thses in our garages should not be tthat difficult! We can all report the results soon after completion and write papers from these scientific observations. Imagine how valuable for all of us would be conducting such research on our own? Mom rode with us to get supplies..noticed her carrying her cane not using it. To get in car..(hmmmm..I thought) A rarely played song came on radio from the 70’s and mom made comment..I had to take you to TG&Y to buy this record when you were in sixth grade. I almost drove off mountain. DRAMATIC improvement in mom..wellness, mobility, and memory. She just renewed her license and passed her eye test without glasses. Lady at test facility looked stunned. Has required glasses to drive for past 50 yrs. I now have a Medical Doctor (toxicologist) and his entire family and parents using product. Friends and family are believers. It complelty eliminated diabetic nerve pain in feet, restless leg syndrome and have noticed I am bulking from weight lifting at 55. I will share more as the results keep pouring in. Big Pharm and Big Brother will continue to cloud the truth. Good luck users …it really works. It would be helpful to know the brand name of the c60oo that causes good results and the brand that causes bad results. I am 59 ..a stroke victim and have been taking http://www.livelongerlabs.com C60live for 6 months. Met them at a show in Denver and the product is frankly AMAZING. Give it a look and see what you think. I do not work or benefit in any way from them or by selling. I just am sharing info that I know would help others. I am diabetic and have neuropathy (nerve pain) and restless leg syndrome for several years. Refused prescription due to side effects. After just one week of taking 2 ml daily of C60live my neuropathy and leg symptoms are all but gone. No change in diet ..shoes or weather..just the C60live. A general sense of feeling good, positive attitude and energy level increase. My blood pressure is the best it’s been since I was a teenager. My clarity of thinking has improved to recall names and events that were a clouded loss. I was skeptical as others I had ordered had little to no effect. IMPORTANT..This lab group explained you must have enough in your system to make a difference. I have a friend who has a spreadsheet of his past couple months results, food.. exercise ..dates.. times.. All actions and effects. I am not as detailed but he has seen remarkable results also. My 8yr old dog was lethargic and slept most days. I started her on small doses to not shock her system with oil and cause bathroom issues. We noticed immediate surge in energy and liveliness. She plays with socks and races through house that we have not seen in years. I have teenagers and livelongerlabs group explained its effect on acne and complexion. My kids faces are flawless and their peers ask what they are doing so different. My wife loves it too. Increased energy and even lost five pounds. She said getting up and down stairs is painless after years of knee pain. We are in our 6th month of usage and notice things improving, skin and fingernails smoothness, and improved muscle strength. We are in our early 50s and have not felt this well in years. Thanks so much for the post! I am an RN with a background interest in hemodynamics & pharmacokinetics. As a stroke survivor, you have an interesting story to tell. So, I am very interested in the details for “amazing.” I don’t mean to pry, but can you tell me before and after symptoms? Symptom resolution? Thanks! I experienced a Ischemic stroke two years ago. My post condition was rather debilitating. Mild slur in speech, 30% loss of usage in my left arm. Impaired balance and plus I am diabetic and my neuropathy and restless leg syndrome just added to the woes. Physical therapy lent little help to recovery except my balance improved some. Learned how to “sling” my arm around more proficiently..( no increase in usage) I was discouraged and frustrated. After testing various products little results until C60live. After visiting with the livelongerlabs team and discussing homeostasis and amounts needed to overcome all negative oxidation body has endured. I took 2-3 ml daily for first week. A general feeling of wellness, positive energy and a large reduction symptoms of neuropathy, leg syndrome and even a fresh new clarity of mind. Over a period of 6 months I have regained 95% plus usage of arm! My speech is close to normal. My balance is good, I even started playing some golf again. All these levels were just a mere dream of yesteryear and all hope of normality was just a thought and elevated my frustration. I am not exaggerating or overdoing it. When the small things are difficult the large things are just a dream. Well I can honestly say I have regained a normal life. We have seen multiple other improvements in skin and vision. All this sounds too good but it’s all explained by doctor and our body’s own ability to return to perfection. I am a true advocate for the product and its measurable improvements in my personal case. I would like to discuss all this with you direct. I am a firm believer of product also and would like to talk usage and other profound positive results. I have several elderly family members and friends and am excited about potential benefits. Oh and you can easily make a magnetic stirrer from a CD computer drive very easy, costs nothing…! Those last few comments sound like deliberate disinformation – in my opinion they should be not ignored but taken as evidence of how dangerous C60 is to big pharma. This stuff could destroy them. As for my own experience the one thing I can report besides the normal positive effects (that is Not placebo effect) is the hairs that had started to grow on my ear-lobes with age (I’m 60) has stopped appearing. I’m delighted the drug companies are freaking out to the degree they evidently are. I concur entirely, especially their use of the word “drug” implying they wish to steer things toward the FDA suppression. You can always identify the moles among mice and rats so to speak. If you live in fear don’t use it just don’t ruin things for those of us who do not live in fear and make the choices of what to do with our bodies very deliberately and after much study. Since C60 binds to DNA, one of its functions may be to silence transposable elements, which are the cause of many types of cancers. This is similar to the function of SIRT6 in likewise silencing such LINE1 retrotransposons. This could explain the fact that none of the C60 fed rats developed cancer, although cancer is a leading cause of death in most rats. Magnetic stirrers are nifty, but a tad beyond my budget. I have found a second hand Hamilton-Beach ice creme maker that’ll do the job of stirring C60 dust into an oil of my choosing (proprietary blend) at adaquate speed and at low temperature. There is a C60 scientific study of mice. It is available at C60 antiaging. They started the mice on C60 at 12 months, Mice usually live a little over 2 years. They used a hundred test mice, half male, half female, and a likewise 100 control mice. They continue on and on with all the details; but basically what they found was that the C60 gives an 11% increase in mouse lifespan. This is a little disappointing compared to rats at 90%; but is is about what one gets from calorie restriction in mice, starting at midlife, indicating that it might be the same pathway. This is also disappointing, because if they were different pathways, one could expect the results to be additive, for a 22% increase in lifespan. Basically (after technical experiments) they concluded that the mechanism was the reduction of the super oxide radical in mitochondria by the antioxidant C60. This is in keeping with the free-radical mitochondrial theory of aging. In any event, taking C60 would be a big improvement over going hungry all one’s life. It is difficult to convert this into human aging. Would that give humans another 11 years of life, or are they more like rats? It could be that every species is different. I have always wondered just how to make the comparison between life extensions in animals and humans. Do we go by percentage, or do we say that the mouse lived another month, so humans would also live another month, or that rats lived another year; so humans would live another year? Or that rats lived almost twice as long; so humans could live to be 200 years old? My 65 Kilo test rat has been on C60 for almost 3 years now. Some have complained about a loss of memory for certain seldom used words, and I suppose my rat has some of that problem. However, I can remember being unable to recall certain words (especially foreign words) all my life, from grammar school on up; and it seems to be common among old people. Nevertheless, the mouse experiment showed the use of C60 kept the memory of older mice up with the level of younger mice, at least as far as searching for an under-water platform goes. These results are from carboxyfullerenes, not C60. Close, but no cigar.